While browsing photos on Instagram, I ran across the hashtag, #KnitTogetherByAdoption. A foster adoptive mother is hosting a photo sharing initiative throughout the month of November for Adoption Awareness Month. Each day she posts a prompt with the topic for the day, that people respond to by posting pictures. The day I stumbled upon this hashtag happened to be the day that they were sharing books. I requested every book suggested, so now I have quite a pile to read! 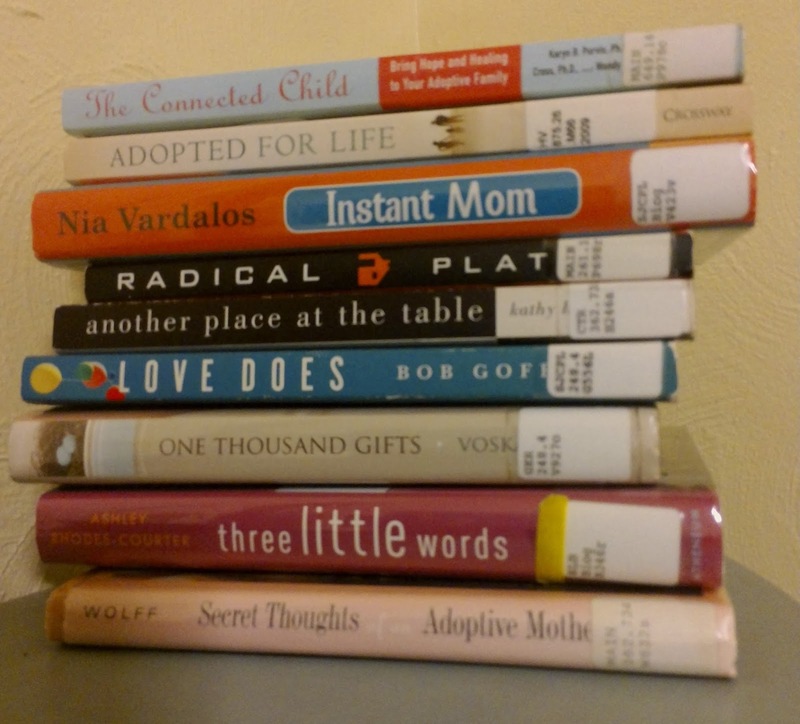 I started with Adopted for Life by Russell Moore. It is about how the Gospel should make adoption a priority for Christians and Churches. Basically the idea is that we are all adopted into God's family and thus adoption is central to who we are and how we should live our lives. I actually found this book to be relatively boring. Sure, it has lots of scriptural references (almost too many!) and good stuff in it, but I didn't actually think it went very deep and didn't find it very compelling. Also, his theology is that of the elect, predestination, and the rapture, so it may or may not jive with what you believe. And his parenting philosophy is that spanking is OK (and often necessary and best) and so he warns that Christians may have a hard time with foster care where corporal punishment is not allowed. I certainly didn't appreciate his encouragement of spanking and discouragement of foster care! "An adoption culture in our churches advances the cause of life, even beyond the individual lives of the children adopted. Imagine if Christian churches were known as the places where unwanted babies become beloved children. If this were the case across the board around the world, sure, there would still be abortions, there would still be abusive homes. But wouldn't we see more women willing to give their children life if they'd seen with their own eyes what an adoption culture looks like? And wouldn't these mothers and fathers, who may themselves feel unwanted, be a bit more ready to hear our talk about a kingdom where all are welcomed?" And second, all of Chapter 7: It Takes a Village to Adopt a Child, is great advice for pastors/priests and churches. It is about the specifics of what churches should be doing to encourage adoption. If you are a pastor or priest or someone with leadership in your church or just someone who thinks your church should do more on this front, read chapter 7! Since Adopted for Life left me unsatisfied, I started another book right away. 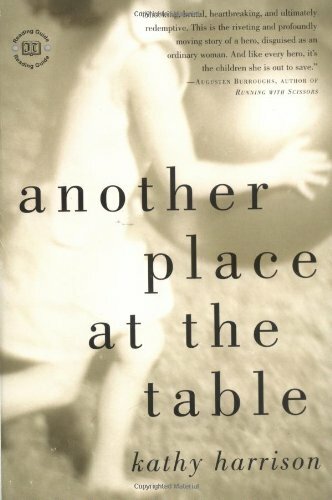 This time I reached for something more personal - Another Place at the Table by Kathy Harrison. Kathy is a foster and adoptive mom who has made foster care her life's work. In this book she tells her story and through it the stories of a handful of her foster and adoptive kids. This is a well written and compelling book! I started it at 8pm on a Sunday night, thinking I'd just read a chapter or two before going to bed. Well, I just couldn't put it down! I especially appreciated her brutal honesty. She doesn't shy away from the heartbreaking and challenging aspects of fostering, but she throws in enough of the triumphs to keep things hopeful. If you are thinking that foster care might be for you, or are just interested in the system from the family level, I highly, highly recommend this one! I'm sure I'll be back in future weeks with more from my stack! Until then, check out more great books at Housewifespice! That second one sounds like a good read for everybody!